Very happy to announce that Alessio Erioli will be teaching a unit within the 2014 AA Visiting School in Dubai (which is the continuation of AA Visiting School in Jordan – see our report here), on invitation by school director Riyad Joucka and along with other unit teachers Suryansh Chandra (ZHA), Omid Kamvari (Kamvari Architects) and digital prototyping tutor Muhammed Shameel. Read on for info & briefs! Dubai: a small fishing town in the Arabian Peninsula, a transient hub that has evolved overtime to become one of the world’s bustling centers of economic interchange. This ambitious emirate has defied the ordinary, to achieve marvelous but sometimes-questionable architectural spectacles. After a severe downfall of the economic recession, Dubai is slowly regaining its global status, this time capitalising on art, design, and cultural exchange as generators of its own identity. To instigate this illuminating revival, The United Arab Emirates is bidding to win the upcoming Expo 2020, with the theme “Connecting minds, creating the future.” Dubai has ambitious plans of the Expo being a congregation of the world’s leading countries coming together to exchange ideas under the headlining key drivers of ‘Sustainability, Mobility and Opportunity’. The ‘World Fair’ has always been a platform for releasing revolutionary ideas into the world. A prominent part of the global engagement with World Expos are the temporary structures built by different countries coming to display architectural and artistic expressions of their respective nations. These pavilions have served as prototypes of pioneering ideas in material science and spatial expression, thus pushing the boundaries of architecture and technology. AA Visiting School Dubai intends to examine the cultural and ecological fabric of the United Arab Emirates, as a precedent to generating a series of pavilions that would represent the candidate hosting country of the upcoming Expo. The process involves breaking away from the cliché of dismissing Dubai as a ‘collage city’ with no cultural or urban identity, going beyond that to formalise a novel archetype that speaks of what is it that makes Dubai a key global player in today’s contemporary world. Throughout the 10-day programme, participants will be familiarised with generative modeling techniques and computational analysis software, through a series of specialist seminars. The group will start by splitting into several sub-units. The first day will commence with an introduction to these digital tools, which will be used throughout the workshop to create a feedback loop between material and digital realms. 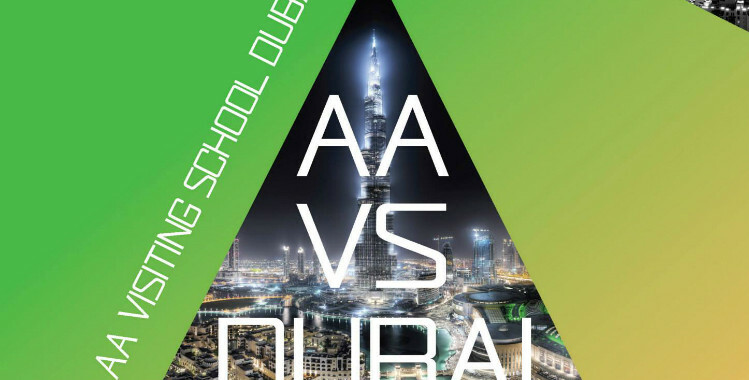 AAVS Dubai participants will take a trip to observe some of Dubai’s landmarks from street view, as well as from an aerial perspective. The purpose of this trip is to search for patterns that embody the emerging cultural identity of Dubai as a postmodern city. Using this gathered information to generate forms in a bottom-up manner, participants will attempt some material testing using analogue form-finding methods. These models will be then simulated digitally using parametric digital modelling tools such as Grasshopper, Processing, Python Scripting and VB scripting for Rhino, initiating a feedback loop for the evolution of the proposed systems. The pavilions will be conceived through the work of groups, collaborating to fabricate an outcome of scaled prototypes. All teams are expected to present their works in parallel to methodologies of morphogenetic design and the processes that lead to complex geometries. Material properties, in addition to physical and environmental pressures, will be quantified in digital simulations. The workshop participants will digitally test their findings to enhance the performance of their prototypes and re-evaluate the results in a feedback loop. This digital form-finding system would potentially lead to an optimal outcome, through generating iterations can be analysed for various fitness criteria and to be developed into an architectural scheme. Participants will rationalize these processes to build up a vision of a spatially variant pavilion that represents the dispositions and ambitions of the UAE, by embodying an accurate representation of the team’s concept of Dubai’s urban Identity.In addition to complete digital presentations, AAVS Dubai will result in a series of large prototypes that are to be fabricated using state of the art digital fabrication facilities. These prototypes should represent the environmental modulation and spatial variation capacity of the generated designs. Weaving is both an ancient tradition and a sophisticated technology that permeates the culture of nearly all countries; the nomadic populations of the Persian Gulf area used wool from goats and camels to weave clothes, carpets and their tents, as well as date leaves for baskets and other artifacts. Crafts tightly linked lifestyle, environment, architecture, material and culture. The uprising of oil age and the diffusion of houses made weaving unnecessary at the cost of cutting loose the continuity with culture and identity that crafts embedded, leading to the potential extinction of an heritage (or its reduction to folklore) instead of allowing its evolution. In Dubai, the exponential burst of the contemporary city further increased the divide with crafts as they could not fit in its new economic and lifestyle model. The unit will explore the aesthetic, spatial and performative potential of woven tectonics through computation-based design medium in the design of prototypical spatial and material system for a pavilion aiming to represent Dubai and UAE in the forthcoming 2020 Expo. Weaving has the potential to bridge the aforementioned divide as an integrated form of tectonics evolving the same logic that permeates traditional crafts. It engages a wider morphological complexity, construction lightness and articulated aesthetic expression, tackling environmental stimuli beyond mere responsiveness. In synthesis, it channels the contemporary lifestyle within a richer identity expression through an active participation of architecture as both its carrier and promoter. The advent of contemporary computational design and fabrication techniques provides a new fertile ground for rule-based systems such as weaving, enabling its evolution with the introduction of growth rules and autonomous agency that discloses new territories of expression in the architectural field. Woven tectonics will be studied in their relation with environmental performances (such as light and radiation), structural performance with relevance to the role of curvature and redundancy, spatial organization and articulation opportunities through continuous topologies and aesthetic potential through the role of pattern formation that is possible with the use of integrated ornament. Ornament (here intended in its original meaning of arranging together, harmonizing) plays a pivotal role as it allows cultural identity to flow through architecture by fusing patterns into tectonics, using detail as the structuring element for aesthetics and merging with space and structure in one heterogeneous yet irreducible whole. We will look into traditional Dubai and Gulf Area weaving patterns and techniques with the intent to understand the inherent computational logic at work within material, structural, spatial and ornamental sensibilities and use them to inform the design explorations.We will promote a form of computational craft through the use of material experiments and computation, mixing intuitive gestures with self-organization, feedback based, processes. The latter, which allows the designers to take advantage of swarm intelligence within its design workflow, will be explored in the form of multi-agent systems coupled with material systems simulation. Weaving patterns, growth paths, spatial articulation, tectonics and ornament will be developed simultaneously across scales through simulations and prototypes and evaluated under performative, spatial and aesthetic perspectives in order to refine the developments into a contextually sound and rich output fusing pattern, culture and tectonics.